S. Kalani Brady, MD has a unique group of patients. Brady is the primary care physician for the last surviving Hansen’s disease (leprosy) patients on the remote Hawaiian peninsula of Kalaupapa. As a physician, he helps protect their health. As an expert and lecturer on Kalaupapa’s history, he helps preserve their legacy. The Library’s latest exhibition, Native Voices: Native Peoples’ Concepts of Health and Illness, features a section on Kalaupapa. It includes interviews with Brady, other health workers, and one of the last patients. 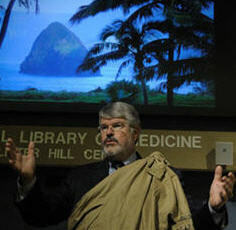 In April, Brady visited NLM, toured the exhibition, and presented a talk on the history of Kalaupapa. Hansen’s disease, then known as leprosy, came to Hawaii in the mid-19th century. Out of fear that the disease would spread, the Hawaiian Kingdom forced people with leprosy to live in isolation. They were taken from their homes and families and sent to Kalaupapa on the island of Molokai. For almost a century, beginning in 1866, nearly 8,000 people were confined to Kaulapapa. Even though a treatment for the disease was found in the 1940s, the forced isolation wasn’t lifted until 1969. Today, about 20 people whose Hansen’s disease is under control live on Kalaupapa by choice along with about 80 other people who are either health care workers or employees of the Kalaupapa National Historical Park. Brady lives there two days a week and heads the medical staff at the Kalaupapa Clinic, which cares for the entire population. As a general internist, he treats the Hansen’s patients for the chronic diseases that arise as a person with Hansen’s ages. The Kalaupapa patients are in their 70s, 80s, and 90s. Brady is an associate professor in the Department of Native Hawaiian Health at the University of Hawaii at Manoa. He came to Kalaupapa about a decade ago to replace a physician who was retiring. The opportunity came through a colleague. His quick acceptance into the Kalapaupa community came because of his work in television—hosting medical segments on a morning news show. He calls his patients his friends. They numbered 50 when he first arrived. With thoughtfulness and compassion, he describes the intimacy of life on Kalaupapa, the loss the residents have experienced, and the legacy that rests with them. The first person to truly help the people of Kalaupapa was the Belgium-born Catholic priest, Father Damien, who arrived in the 1870s. Brady shared his knowledge of Kalaupapa and Father Damien in his April 13 lecture at NLM, “Kalaupapa and Father Damien: ‘Here I Am, Send Me,'” which is archived and can be viewed on demand. Wearing a Hawaiian sarong, and opening with a Hawaiian chant, Brady first provided basic facts about Hansen’s. Then he stepped away from his slides and the podium and began weaving the story of Kalaupapa before, during, and after Father Damien. Brady, who used to act and was in an opera company during college, described in captivating detail the hopelessness, despair, drunkenness and debauchery of Kalaupapa in the early 1870s. 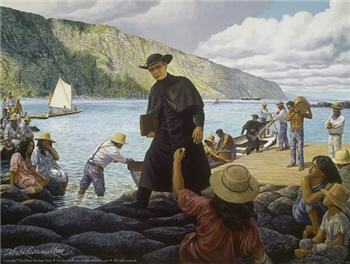 He then turned to the arrival of Father Damien, the care he provided, and how Kalaupapa changed after Father Damien revealed he had developed leprosy. Leprosy is very hard to get; most people are immune to it according to Brady. Brady says Father Damien and one other health care worker he’s heard of are the only other people to get leprosy in the history of the settlement. “Being us instead of them, a new respect occurred for Damien and an increasing number of Kalaupapa patients fell behind Damien in a walk toward forgiveness, toward humility, toward grace and acceptance,” Brady explained. “God gave him the dubious gift of becoming like those he ministered. The people today in Kalaupapa see him as a spiritual father. Some of them believe they have communed with him, that he has come back and spent time with them.” When Father Damien was canonized in 2009, several patients from Kalaupapa went to Rome and Brady traveled with them. Top Photo: NLM Director Donald A.B. 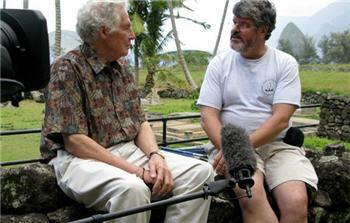 Lindberg, MD (left) interviews S. Kalani Brady, MD in 2011 for the NLM exhibition, Native Voices: Native Peoples’ Concepts of Health and Illness. Middle Photo: S. Kalani Brady, MD delivers his April 13, 2012 talk “Kalaupapa and Father Damien: ‘Here I am, Send Me. '” Photo by Bill Branson. Bottom Photo: Painting of Father Damien featured in NLM’s Native Voices exhibition. Courtesy Herb Kawainui Kane Family Trust.